I found a few images of tops, including this crude copper alloy top (pictured below) and the onion-shaped wooden tops pictured above. The copper alloy top is from East Sussex, England, but its dating is a rather inexact “post-medieval”. It measures 23 mm (0.9 inches) long and 22 mm diameter, and it weighs just under 4 grams (0.137 oz). 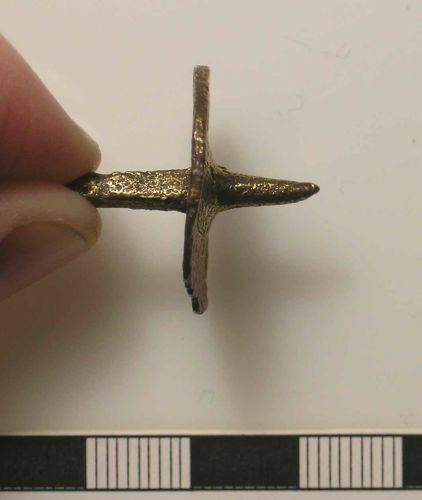 Although the web site suggests this is a top in and of itself, I think there’s a fair chance that this was actually a metal tip that may have been inserted into the point of a wooden top like those pictured above. Of course, that’s not to discount the equally valid possibility that it really was just a crude metal top without any further apparatus.